When it comes to begonias it is usually easy to answer that one: the males are the most spectacular and attractive and the females are rather insignificant and are sometimes picked off! 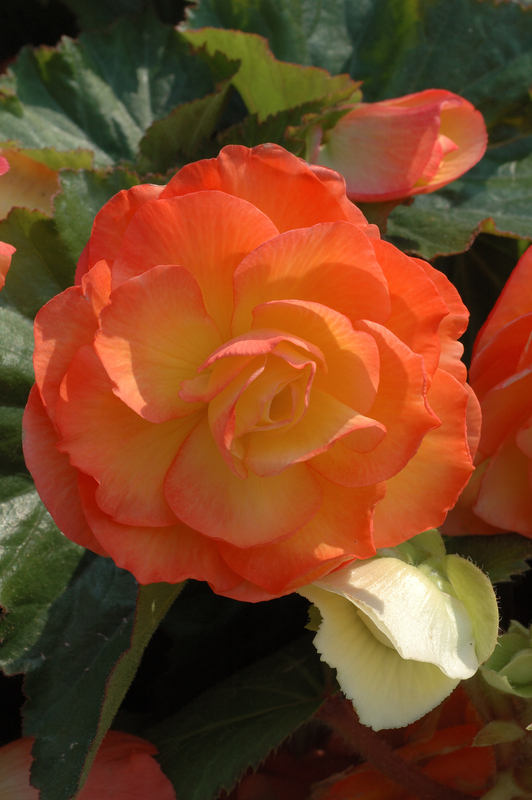 I am talking about the flowers on the most common types of tuberous begonias. The plants carry both male and female flowers and the usual arrangement is to have one large, fully double flower in the centre, at the end of the stem and two female flowers, one on either side, jostling for space. They are smaller, have fewer petals so the branched stigma can often be seen in the centre, and they have a three-winged seed pod at the back. If you are serious about growing and showing begonias you will want to remove the female flowers as soon as you can because they take up valuable ‘energy’ the plant could be putting into its perfect male flowers and the two of them can gang up and push the male flower off – they certainly cramp its style! But in case you are female and thinking this all sounds a bit sexist and familiar, you can have a laugh because the males put so much effort into their appearance that they usually have no stamens so are sterile! 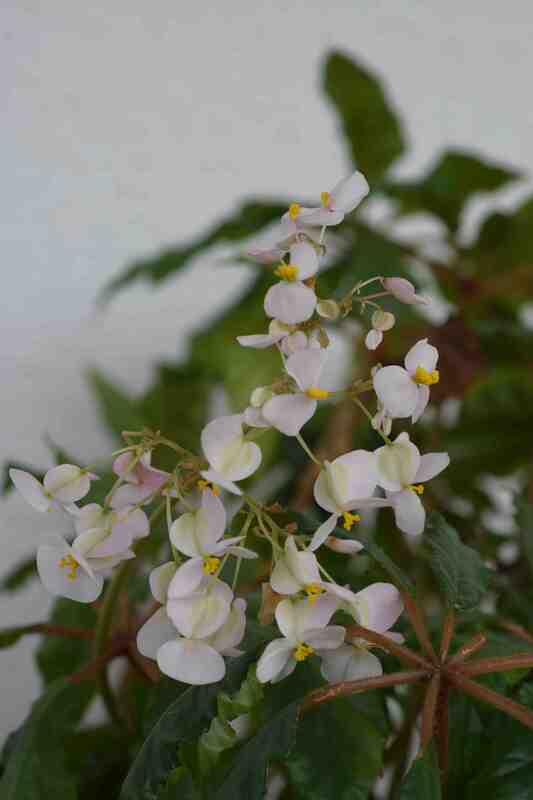 So I was looking at my Begonia carolineifolia yesterday* and having a good look at the flowers as I was picking up the dozens of dropped ones, and I noticed that the females are actually more showy than the males. 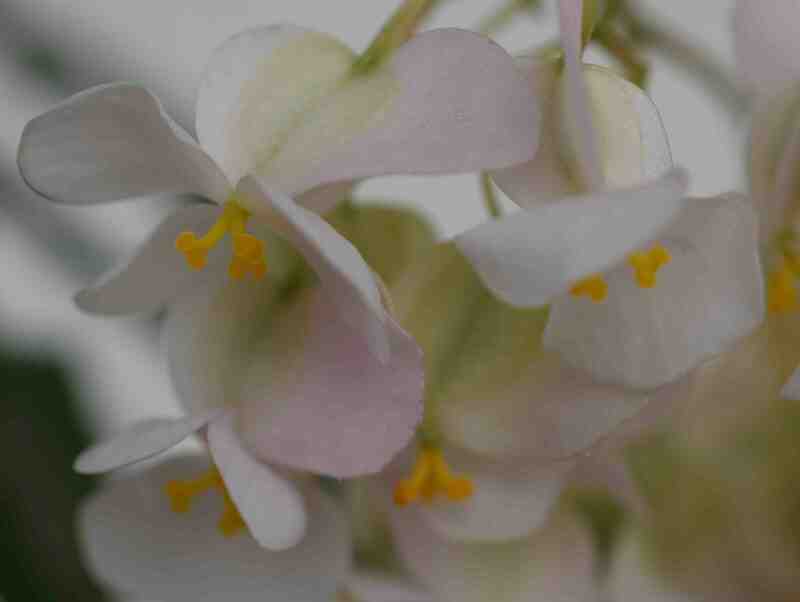 The flowers start as pale pink buds and turn to blush white as they open and the males have just two petals (male begonias usually have two larger ‘clamshell’ petals and two smaller, inner ones) while the females have four or five petals of random sizes. And that seed pod at the back provides a bit of extra colour too. Male flower below. I hope these look better on your screen than on mine. I chose soft light because of their pastel colours but they look very grey (and noisy) on here! 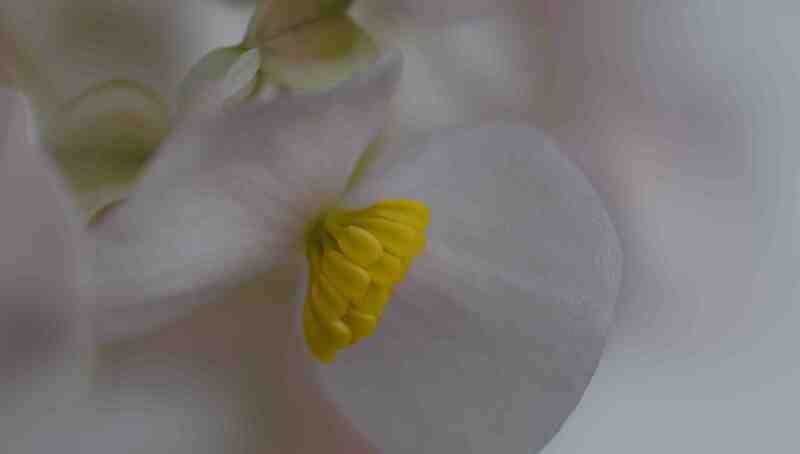 Looking at your photo I am wondering about a really nice small white flowered begonia I did have, which I was told was fairly hardy outside. It made one winter but died last winter. I’m afraid I didn’t look after cuttings I took well enough which died also. I never knew the name but I thought it a terrific plant. Very neat and florificerous over a long period. 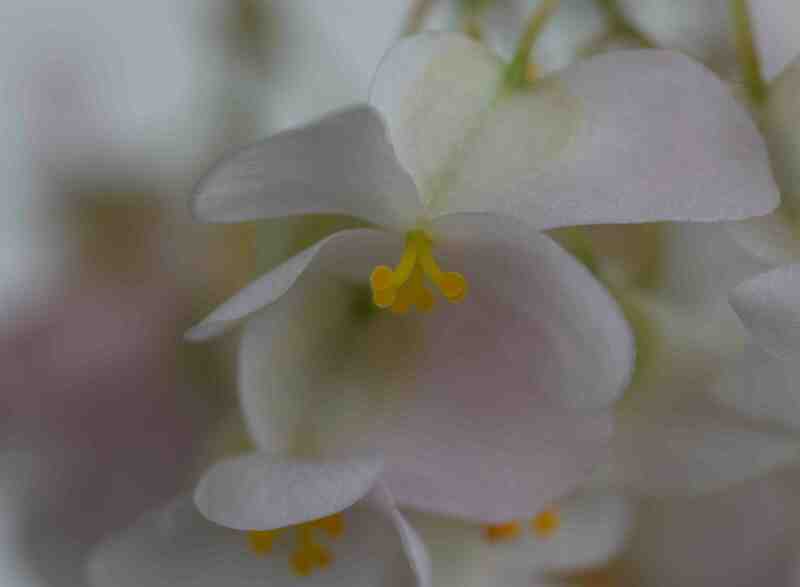 I am not generally a big begonia fan either. I think the original plant came from a visiting speaker from UK and someone propagated a few plants from it.